The use of the English article system poses difficulties for most learners of English. Previous research have found that Arabic learners of English seem to have certain difficulties in using the English articles, e.g. the use of the English indefinite article is believed to be particularly problematic, as the Arabic language has no indefinite article. This study aims at investigating the use of the English articles in the writings of Emirati students in particular. 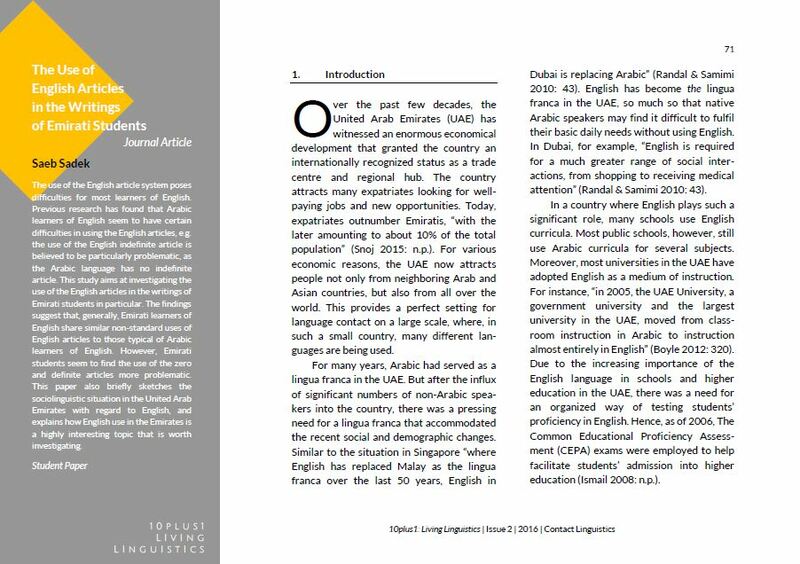 The findings suggest that, generally, Emirati learners of English share similar non-standard uses of English articles to those typical of Arabic learners of English. However, Emirati students seem to find the use of the zero and definite articles more problematic. This paper also briefly sketches the sociolinguistic situation in the United Arab Emirates with regard to English, and explains how English use in the Emirates is a highly interesting topic that is worth investigating. Saeb Sadek is enrolled in the master program British and American Studies at Bielefeld University. He works as a student assistant in the English Linguistics department there, too. His research interests mainly include the study of World Englishes. More specifically, his work at the moment examines the Use of English in the United Arab Emirates.